America is more divided than ever. With protests and riots going on across the nation, we are a nation constantly at each other’s throats. Perhaps not since the 1960s or even the Civil War has America been so divided and so hateful towards each other. Who do we blame for this? Trump? Democrats? Protesters? No, the media. 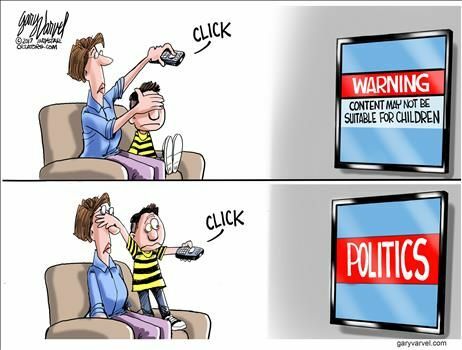 This cartoon perfectly states that political TV has become unsuitable for ALL ages! 24-hour news has poisoned us. Everything is constantly BREAKING and HUGE and a SCANDAL! I look back fondly on the days when the news was 30 minutes each night plus whatever the paper’s decided to publish. That was it. There wasn’t CNN and MSNBC constantly flooding the airwaves with freakout after scandal. According to the American Press Institute nearly 35% of Americans are constantly watching the news. More information isn’t always a good thing. Seeing so many negatives story can have a negative effect on your brain. I miss the simpler times, don’t you? I think I will take a news and social media diet. Just little bites a few times a day. The rest of the day I am going to devote to working, reading, or perhaps picking up a new hobby. Are you tired of the constant news cycle? Share your thoughts in the comments.